I have a few more videos in progress and will post them as I get them edited. The editing, including cutting, splicing, voice over and music selection takes far, far, far longer than it takes to do the paintings. But I'm getting there. For now, here's a couple of teaser images. 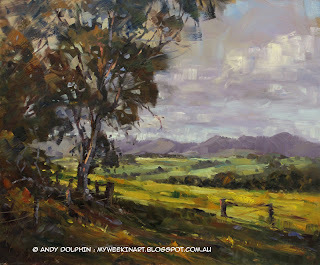 The first video will be this plein air oil landscape sketch I painted last weekend. Plein air sketch. 30x25cm oil on board. I will follow that up with a digital seascape I whipped together a few nights ago, following a request from my (second-)newest sister-in-law. 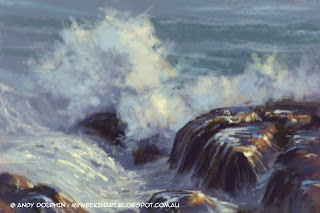 This painting is based on a small section from a plein air seascape oil painting I did at the start of the year. It's nothing too amazing but gives some insight as to how I approach my digital doodles. The first video shouldn't be too far away so keep an eye out for an update. I filmed another plein air painting session today at a terrific new spot just five minutes from home and where I hope to find quite a few more painting opportunities. I still have to check the footage, because lots of things can go wrong when you do your own video whilst painting - like standing directly in front of the camera so all it sees is the back of your head, forgetting to press "start", kicking the tripod without realising and filming a fence post, glaring reflections, poor focus and much more, not to mention technology itself inventing new and interesting ways to bring a great plan unstuck. I think it will be okay but that update will be a while away. Keep checking back here or on my Youtube Channel. Love the teasers and will look forward to the movies. (Technically speaking, I do believe she's the newest SIL). It turns out I have no concept of time. Technically speaking, the law views de facto relationships as marriages for all intents and purposes so technically, in law, Kathy has been my sister-in-law for a while.